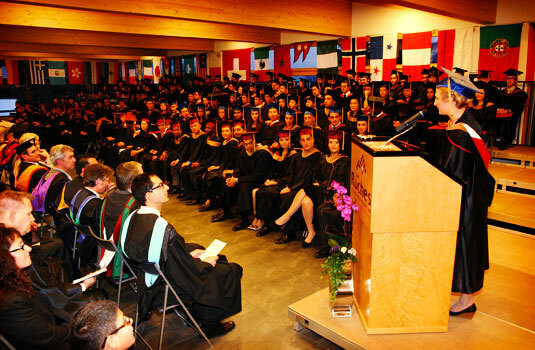 Share the post "Graduation day at Les Roches International School of Hotel Management"
In a snowy but electric atmosphere, more than 200 students from Bachelor, Master and Postgraduate programs received their diploma at Les Roches International School of Hotel Management on Friday, December 3, 2010. “I want to thank you, Les Roches, for all the doors you are opening for us”, said a Russian valedictorian, speaking for her class and exemplifying the ambience on graduation day. More than 200 students, from almost 100 different nationalities, were all dressed up with the graduate’s suit and hat, waiting for the last step to the future. They were individually called by their program manager to receive their diploma and congratulations from the CEO Arie van der Spek together with Colin Small, Dean of undergraduates, or Jeremy Hutchinson, Director of Academic Affairs. Students in tears were waving to their excited and emotional parents who were queuing to take a picture of their prodigious children. It was definitely a moving afternoon in the famous Swiss hospitality management school. The ceremony was followed by a very nice cocktail reception and buffet prepared by younger students, probably dreaming of their own graduation day.